David Fienup (pronounced “fee-nup”) started Soundopolis, LLC in 2012, which is an all-encompassing brand for his work in sound recording, editing, sound effects sales, and much more. Soundopolis is a Registered Trademark in multiple classes with the United States Patent and Trademark Office. The Soundopolis logo (above) was envisioned by Fienup, and created by Jack Carder (http://www.hyphaltrelli.net). While David is the sole-proprietor of Soundopolis, he often sub-contracts from his group of highly-trained and experienced sound engineers when a task requires multiple participants. 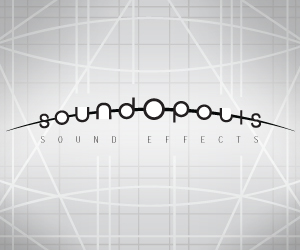 Soundopolis.net is David Fienup’s sound effects distribution website. Here you can purchase sound effects collections, and download FREE sound effects! Collections range from $5 to $150 depending on the size and scope of the library. All collections are sold at a minimum of 48k/24bit. HD denotes a 96k/24bit library. Please see the website for details about each library, including preview tracks and track lists.